Rotherweird is a hidden state with historical secrets and probably a cover-up. Nothing new in many ways in these days of intrigue. Welcome to a world with no powered transport or computers and Internet. A brave new world indeed. Fierce border controls and an extreme reaction to outsiders. One might say this is timely indeed when the UK has voted to turn its back on Europe. I couldn’t possibly comment. The town and countryside of Rotherweird in England gained its independence under Elisabeth I and rarely invites anyone to join its community but when Jonah Oblong needs a teaching job that doesn’t require references he is amazed to be offered the post of teacher of Modern History in the local school. Modern history because nothing is taught about the period prior to 1800. Another outsider has lately come into Rotherweird. His intentions are unknown but he has taken over the manor house unoccupied for centuries, He has hired a wife and son to give him a veneer of respectability. He has bought his way in and Sir Veronal Slickstone intends to make quite an impression. 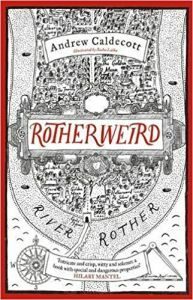 Rotherwierd is accordingly populated by bizarre and wonderful characters such as Orelia Roc, the co-owner with her social climbing Aunty Deidre Banter of the Baubles and Relics Antique Shop. Oblong must negotiate both North and South tower scientists within the school. The head of the north tower is the irascible Strimmer and his employee, Vixen Valourhand, has hidden depths. Oblong is flung into a mystery where the previous history teacher is not spoken of after vanishing. He is trying to do his job but somehow other stuff gets in the way. I love this book as it is both joyful and intriguing with a setting that conjures up the tech-less world of both Rowling and Pratchett. It manages to steer its own course and offer a great story with a patchwork of characters. Being one of three, I look forward to how the town of Rotherwierd moves forward from the events in this book.